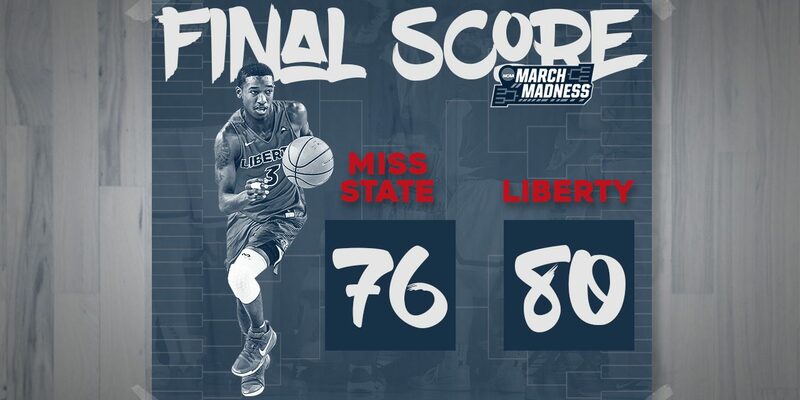 Liberty defeated Mississippi State, 80-76, in the first round of the NCAA Tournament. It is the Flames’ first ever win in the Big Dance and the biggest win in school history. Mississippi State opened the game with a quick 7-2 lead as both teams tested the waters. Nobody on the court has ever been to an NCAA Tournament, so the rust and nerves were apparent early. After the first media timeout, Coach McKay went to his bench as Myo Baxter-Bell and Keenan Gumbs made immediate impacts. Myo got a bucket while Keenan knocked down a 3 to keep Liberty in the game. The Flames trailed 15-10 at the under 12 media timeout. Liberty would knock down 4-of-5 shots, including a 3-pointer by Lovell Cabbil to cut MSU’s lead to 1 by the under 8 media. After struggling with the Bulldogs’ length on defense, Liberty’s offense settled in and was able to find some gaps in Mississippi State’s defense. Scottie James was able to settle in and battle in the paint with the big bodies Coach Howland threw at him. The Flames would continue to play well on both ends of the floor, taking the first lead of the game with 5:27 left before halftime on a Caleb Homesley 3-pointer to make it 26-24 as Ben Howland called a timeout. Liberty was shooting 53% from the floor 4-of-11 from 3 to this point. Myo Baxter-Bell and Keenan Gumbs continued to provide sparks off the bench. This duo combined for 12 points in the first half, as Myo mixed things up in the paint while providing his usual energy and Keenan knocked down both of his 3 point attempts. Gumbs’ 2nd three pointer of the half put Liberty back ahead at 29-26 going into the final media timeout of the first half. The Flames would remain hot from behind the arc for the entire first half, as Georgie Pacheco-Ortiz got in on the action as Liberty pushed its lead to a first half high of 4. The Bulldogs would answer with a 6-0 run to take a 37-35 lead into the locker room. Homesley led the Flames in the first half with 8 points and 3 rebounds while Scottie James had 4 points and 5 rebounds. Both teams shot over 50% from the field and 40% from 3 in the first 20 minutes while the Bulldogs led in points in the paint, 20-10, points off turnovers, 8-6, and fast break points, 5-0. The first 5 minutes of the 2nd half were deadlocked as both teams scored 9 points each in the opening minutes. The Bulldogs and Flames continued to connect from 3, each knocking down a triple in the opening minutes. MSU’s length continued to play a factor, they racked up 4 blocks in the first 25 minutes of game action. The block party would continue as the Bulldogs blocked 3 more Liberty shots in the next 4 minutes of game action. Liberty would regain the lead for the first time in the 2nd half on a Homesley and-1 on a beautiful out of bounds play call from under the Liberty basket with just 3 seconds left on the shot clock. MSU would again respond with a quick 4-0 run to capture the lead at 53-50 with 11:14 to play. The score was all knotted up with 10 minutes left to play. Mississippi State took a 56-53 lead as they knocked down a corner 3 following a couple of open misses from the Flames from behind the arc. Liberty opened the 2nd half just 1-of-5 from 3 compared to the Bulldogs’ 3-of-5 shooting from 3 through the first 11 minutes of the 2nd half. A Liberty turnover and another MSU three pointer out of the timeout would push the lead to 6. The run would grow to 10-0 in just under 2 minutes as the Flames fell behind by 10 points at the 7:11 mark. With Liberty’s back against the wall, Homesley got fouled shooting a 3 pointer. He would make all 3 free throws and sparked a Liberty run that would cut the Bulldogs lead to 3 with 4:45 left. Homesley was on fire over the stretch, knocking down free throws, hitting three pointers, and throwing down a dunk. The first-team all-ASUN performer scored 14 points in a 4 minute stretch as the Flames went from down 10 to up 2 with just less than 3 minutes to play. Homesley’s three pointer with 2:37 to play brought the Flames back ahead, 69-67. After 3 Mississippi State free throws to take the lead back, senior Lovell Cabbil hit a three-pointer from the wing to put the Flames back up, 72-70, with 76 seconds to play. From there, Liberty would be stellar from the charity stripe to close out the win. Homesley finished with a career-high 30 points on 10-of-16 field goals, 5-of-11 from 3 and 5-of-6 from the charity stripe. Cabbil added 18 points on 4-of-7 field goals, 3-of-4 from 3, and 7-of-8 from the free throw line. He also added a team high 5 assists. Myo Baxter-Bell had 13 points off the bench, adding 4 rebounds and 4 assists. He made 7 of his 8 free throws. Mississippi State was shooting over 50% from the field most of the evening, but they finished the game making just 1 of their last 11 shots. The Flames shot 48% from 3, connecting on 12-of-25 shots from behind the arc. 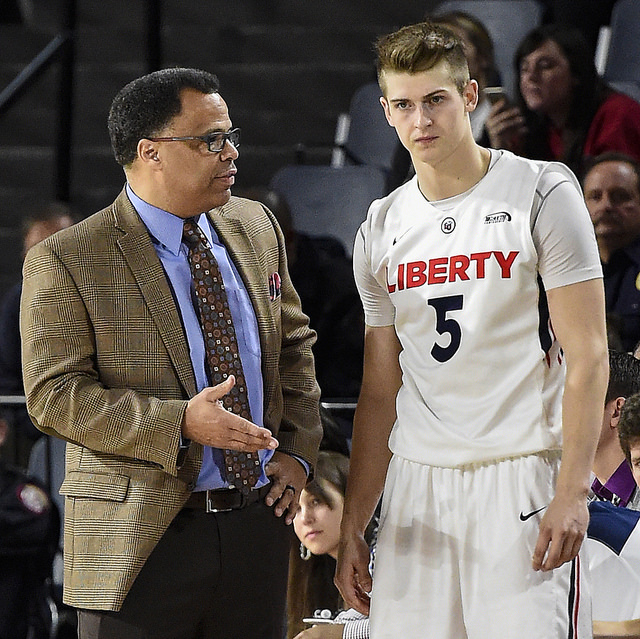 Liberty won despite getting beat in the paint, 32-22, and in fast break points, 18-7. Liberty advances to the second round of the NCAA Tournament where the 12-seed Flames will face the 4-seed Virginia Tech Hokies. Tip-off is scheduled for 7:10 p.m. eastern from San Jose. The Flames and Hokies faced each other in an early November scrimmage at the Vines Center a few months ago with Virginia Tech prevailing, 86-70. The Hokies defeated 13-seed Saint Louis, 66-52, Friday night.